this card will remain forever as i've got it in my "special album". i love it and again, thank you. BWHAA!! HAA!! I love this!! My kid goes around saying that now...cheese and crackers!!! That's what this made me think of!! Too darn cute Karyn!! TFS! 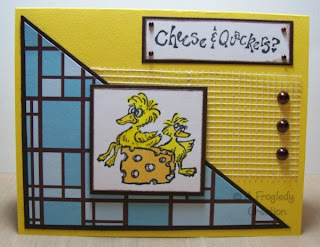 this is so cute and kids would love to get this card.